The 2017 Notre Dame Schools Golf Tournament will take place on Sunday, September 10 at the Twin Ponds Golf and Country Club in New York Mills, NY. We greatly appreciate the support of our many sponsors and golfers! 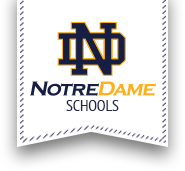 All proceeds from the tournament will benefit programs at Notre Dame Schools.